The Enrange™ Flex EX series of radio remote controls provides a cost-effective solution to the restrictive use of hardwired pendants. 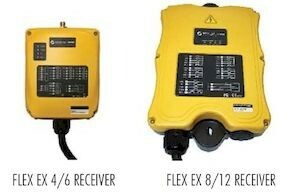 Each Enrange standard radio control system includes 2 transmitters with four 2-speed push buttons, 1 receiver, manual, transmitter label sheets, waist belt, vinyl transmitter covers, pre-wired output cable, internal transmitter and receiver antenna, extra fuses, jumpers, batteries, key switch, and necessary mounting hardware. Protective rubber boot is available as an option for additional cost and is recommended to protect against drop damage to your remote. Advanced microprocessor controls with 32 bit CRC and Hamming Code provide ultra-fast, safe, precise and error-free encoding and decoding. 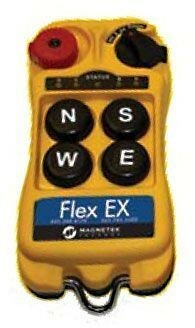 Flex EX is equipped with more than 200 programmable functions to suit all types of applications. A wide variety of accessories is available to provide additional protection and flexibility, including protective rubber transmitter boots, padded nylon transmitter case, retractable belt clip, and horn kit. Reliable pushbuttons feature gold-plated contacts and are rated for more than one million press cycles. The defined snap-action steps provide positive tactile feedback even while wearing gloves. Durable enclosures are made from industrial-strength nylon and fiberglass composite materials. Two “AA” alkaline batteries provide more than 100 hours of operation. A rechargeable battery kit with LED indicators is also available. Advanced synthesized RF controls with 62 user-programmable channels add flexibility to frequency management in the field. 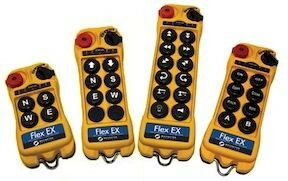 Each Flex EX system has over one million unique identification codes (20 Bit) and never repeats. System ships Standard with 110-120v control. 24VAC control is available for additional charge due to need for extra transformer. Call 800-509-6131 for availability or application specific details.